~ On August 23rd 2016, I left on a trip that would unknowingly change my life forever. 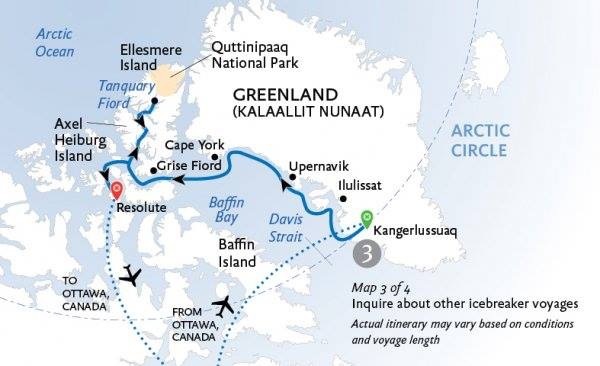 I was invited to join "Generator Arctic”, a group of filmmakers, photographers, and writers from around the globe (chosen by Canadian Astronaut Col. Chris Hadfield) to embark on an 18 day expedition through the Northwest Passage to the furthest fjords of Ellesmere Island. Our home: the infamous Kapitan Khlebnikov, a 24,000 horsepower Soviet icebreaker (the first ship to circumnavigate both the Arctic and Antarctic). Our mission: to document this remote corner of our planet through art and science, and share it with the world. There in cabin 712 I set up a make-shift studio and tried to capture the indescribable beauty and magnitude of this adventure through song. Once home, I handed off the recordings to renowned film and television composer (and childhood pal) Rob Carli who wrote brass and string arrangements to accompany them. The album is dedicated to the sailors, chefs, helmsman, engineers, dishwashers, bar staff & maids of the Khlebnikov. To our glorious, fragile planet and precious wildlife. To the communities we visited and every soul that has ever navigated these waters ~ Endless thanks to Evan & Chris Hadfield, Rob Carli, Karl Kannstadter & Quark Expeditions. Your arctic adventure begins a little further south, with an overnight stay in Ottawa, Canada’s capital city. Stroll along the charming Rideau Canal, discover the majestic Canadian Parliament buildings, and explore the markets, world-class museums and shops on offer. Plan to arrive and make your way to the hotel in time for our pre-departure briefi ng at about 6pm. After a morning charter fl ight to Kangerlussuaq, you’ll be transferred to the ship by Zodiac. Kangerlussuaq is a former U.S. military base and serves as the international gateway for the majority of travel to and from Greenland. Enjoy time out on deck taking in your new surroundings before setting sail on your arctic expedition. Kayak is an Inuit word the English language has borrowed to describe a small vessel propelled by paddles that seats one or two people. When ashore in Sisimiut, travelers will watch a demonstration of traditional kayaking. There will be time to explore the town, where 18th century buildings from Greenland’s colonial period still stand! Ilulissat Kangerlua is Greenlandic for “The Iceberg Fjord.” The glacier at the head of the fjord is the most productive in the Northern Hemisphere. The icebergs it calves fl oat down the fjord to enter Baffi n Bay. As the ship approaches Ilulissat, have your cameras ready to take photos of young icebergs. Their journey will end years later somewhere off the coast of Newfoundland. So significant is Ilulissat Fjord that UNESCO has designated the area a World Heritage Site. We’ll take you on a Zodiac cruise near the mouth of the fjord and later visit the community and hike to a spot inside the fiord to watch the massive bergs lined up before entering Baffin Bay. You’ll want to be out on deck regardless of the time of day as the ship approaches Uummannaq. The vista is simply breathtaking. The heart-shaped mountain that gave the town its name dominates the view. Uummannaq was founded as a Danish colony in 1758 on the Nuussuaq mainland, but in 1763 it was moved to the nearby island, as seal hunting was more plentiful there. On your walk through the town, you’ll visit the historic oil warehouse built in 1860. Look for the peat hut, behind the warehouse, which was still in use until a few years ago. The region of Upernavik is almost the size of Great Britain. The town of the same name was founded in 1772, but the history of human habitation in the region is longer. In Upernavik you will visit the northernmost open-air museum with well-preserved buildings dating back to colonial days. Unique fauna is another compelling reason to visit the Upernavik area, where the world’s largest bird cliff, Apparsuit, is located. Today you’ll hear stories of the famous Cape York Meteorite, and learn about the place other meteorites have had in Cape York’s history. If conditions permit, we`ll take the helicopters and fly to the Robert Peary monument at the top of Cape York and experience a very impressive view. At Qaanaaq, founded in 1953, you will visit the northernmost municipality in the world, and learn about the culture of the people of Northern Greenland. One of the highlights of the museum is a massive chunk of meteorite. Murres and fulmars will soar overhead as you cruise in Zodiacs along the base of high cliffs at Cobourg Island. Thousands of seabirds nest in Nirjutiqavvik National Wildlife Area, established to protect the wildlife of Lady Ann Strait along the island’s southern shore. Be sure to carry your camera and binoculars! The only community on Ellesmere Island is Grise Fjord. The citizens of Aujuittuq – the place that never thaws – will entertain and educate you with cultural demonstrations are based on 4,000 years of tradition. The tiny hamlet, the most northerly community in Canada, has only 140 residents – slightly more than one resident per guest aboard our icebreaker. From there, the ship navigates Hell Gate, a narrow passage transited successfully by only a handful of passenger vessels. Our next stop is Eureka Sound. Helicopter flights take us over an ancient petrified forest on Ellesmere Island’s western coast. The epic beauty that is Tanquary Fjord encompasses sweeping mountain valleys under huge arctic skies. Luminous glaciers cascade down to clear blue waters. Twenty-four hours of daylight provide ample opportunity to take photos in Quttinirpaaq National Park on Ellesmere Island. Eureka has been called the “Garden Spot of the Arctic” due to an abundance of flora and fauna found in the area, more so than anywhere else in the High Arctic. The Weather Station consists of “Fort Eureka” (for military personnel), the Environment Canada Weather Station, and the Polar Environment Atmospheric Research Laboratory (PEARL), formerly the Arctic Stratospheric Ozone Observatory (AStrO). At Axel Heiberg, you’ll learn about its unusual fossil forests. At the Norwegian Bay and Belcher Channel, there are many wonderful and exciting sights. However, the experience of watching the 24,000-horsepower Kapitan Khlebnikov battle its way through some of the toughest ice in the world may be one of the most memorable. We then head south through Penny Strait to Queen’s Channel, with plans to explore McDougall Sound, on the alert for walrus and polar bears. We’ll traverse the natural waterways of Penny Strait, Queen’s Channel and the Crozier Strait. Expect to see copious birdlife above, and magnificent views ahead. Just offshore the western end of Devon Island is Beechey Island. There, on a stony beach, stand three grave markers; solemn reminders of the lives lost during Sir John Franklin’s search for the Northwest Passage. Upon approach to Beechey Island, we will be treated to presentations about Franklin and his expedition. Bid the land of the midnight sun adieu. You will return by afternoon charter flight to the world of night and day in Ottawa, where you will be transferred to the hotel and sleep through your first full night of darkness in two weeks. After breakfast, you can make your way home at your leisure or spend time in Ottawa, Canada’s capital city.